I dont known where place this topic... so i create it here. May be someone will be interested what i do. 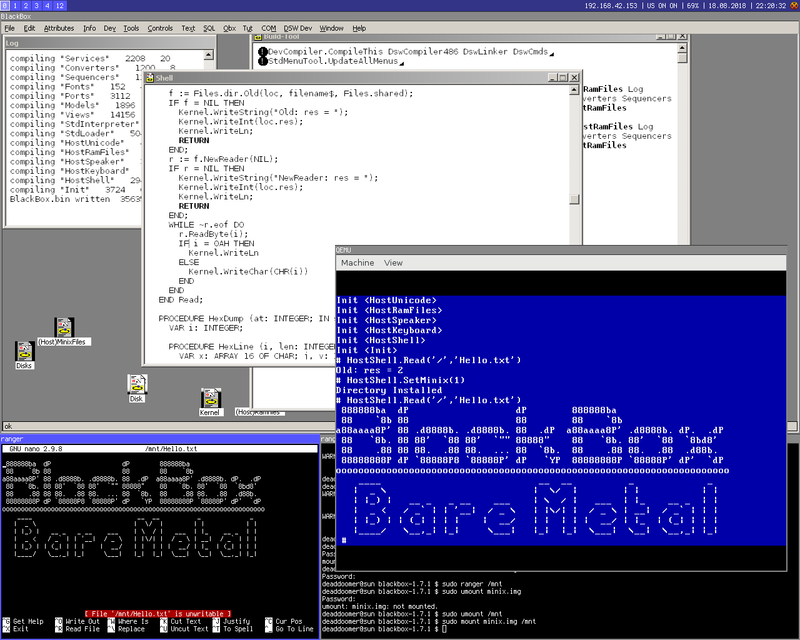 This is a port of BlackBox to bare metal x86 PC i.e. without host os. Currently on early stage, without graphics. 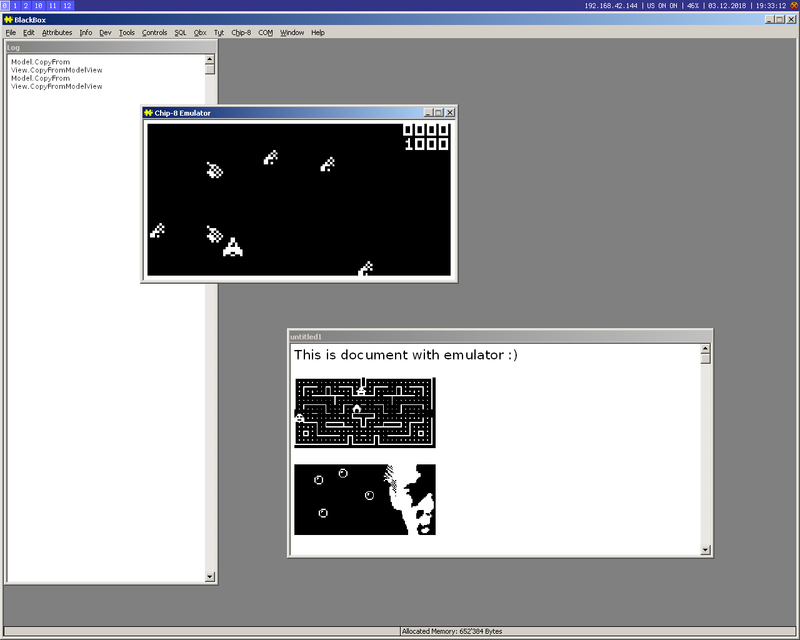 I just learn how to make views in BlackBox... and i make chip8 emulator with debugger and disasm for it. Useless thing. Public beta release expected at the end of year. Last edited by SovietPony on Fri Dec 14, 2018 8:26 pm, edited 6 times in total. most views in sources can be treated as identical. good projects! i will follow you. Question about how to compare Views still actual. Very interesting and ambitious projects. How difficult would something like diff3 be given that you already have diff? Is a 3-way merge also something that is within reach? I never use diff3 by hands, so i dont known how it works... but i think that diff3 implementation not harder than ordinary diff or patch. I try to implement it later. I implement three-way merge (diff3), but i still need to implement Patience Diff Algorithm to produce more quality diffs and conflicts. Also, i think we can integrate this module into git if make custom diff3 utility. 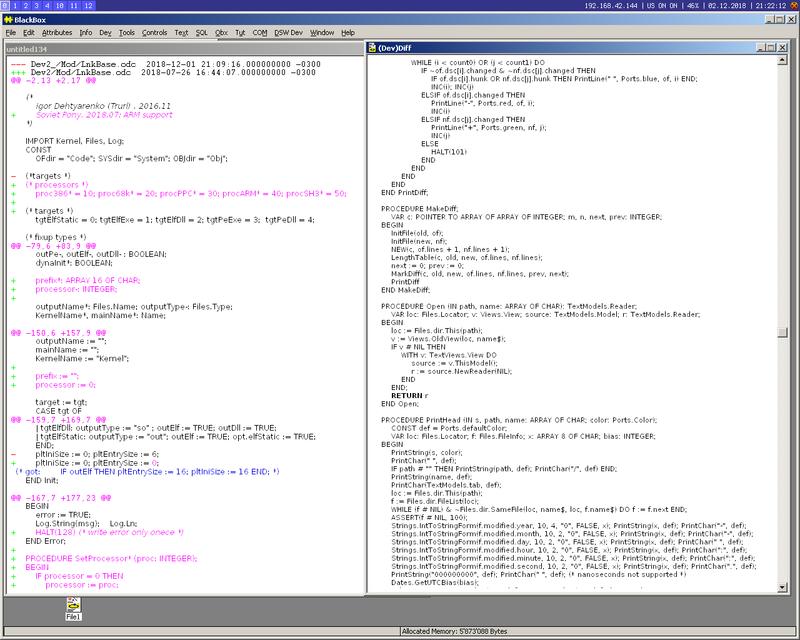 SovietPony wrote: I implement three-way merge (diff3), but i still need to implement Patience Diff Algorithm to produce more quality diffs and conflicts. I already made dedicated command line tool... well it just fully linked BB with command line interface for DevDiff, so it can be integrated with git. I described how to do it in README. I have no more time for this tools, i must continue work on bbarm. Can someone please change the title of this topic. I don't know if it is intended to be offensive, but in English it is offensive.